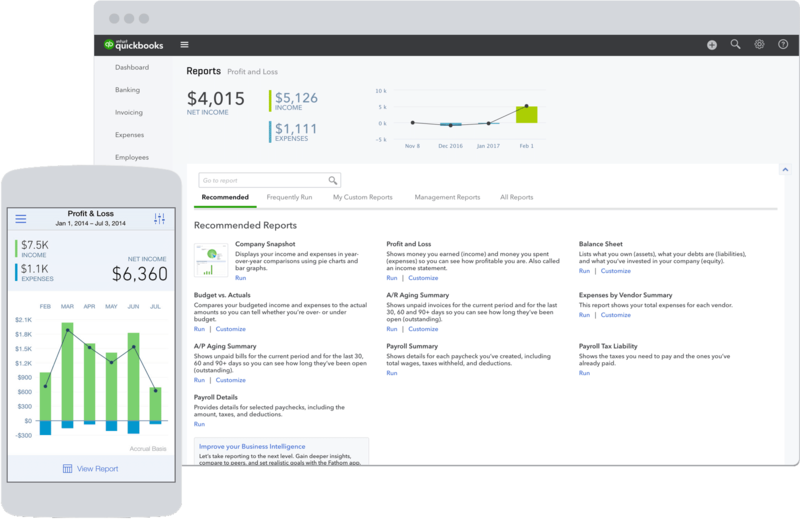 Generate and review accurate financial statements anytime with QuickBooks. The financial statements you need to better run your business. Financial statements, also commonly referred to as financial reports, are detailed records of a business’s financial activities. They are critical components in understanding whether your business is making or losing money. Because QuickBooks tracks and organizes all of your accounting data for you, you can review financial statements anytime to know where your business stands. The balance sheet, the income statement (also called the profit and loss statement), and the cash flow statement are a business’s three basic financial statements. With QuickBooks, it’s easy to access financial statements to review your financial performance. You can even schedule QuickBooks to automatically generate and email financial statements to your colleagues, your investors, and other stakeholders. Easily customize your company’s financial statements and tailor them to your unique needs. Customize the data rows and columns, choose date ranges, filter the data by account or transaction, and more. In just a few clicks you can email financial statements, export them to an Excel spreadsheet, or print them. The three cornerstone financial statements of any business are the balance sheet, the income statement (also called the profit and loss statement), and the cash flow statement. Business owners, investors, suppliers, banks, and the IRS use a business’s financial statements to understand the financial position, financial performance, and cash flows of a business. The balance sheet details what a business owns (assets), what it owes (liabilities), and its net worth (equity) at a specific point in time. The income statement details a business’s revenue, expenses, and profits (or losses) over a specific period of time. And the statement of cash flows details the movement of money into and out of the business. These three reports are central to understanding the financial condition of the business and are a key component in making smart business decisions. Accurate financial statements are a critical component to managing any business. QuickBooks tracks every dollar coming into (revenue) and going out of (expenses) your business. Because all of your financial transactions are recorded in one place, you can easily generate accurate financial statements so that you can measure and understand your business’s financial health. More than financial statements. Run your entire business with QuickBooks. Easily track business expenses all year to get every deduction at tax time. QuickBooks automatically sorts expenses into expense categories and keeps them organized in one place so you never miss a tax deduction. Bookkeeping supports every other accounting process, including the production of financial statements and management reports. QuickBooks automates standard bookkeeping tasks such as entering transactions, performing calculations, and organizing data to keep your books balanced. With QuickBooks Capital, we use the financial data you already track in QuickBooks to help you apply for a small business loan. We pre-fill your loan application with information from your QuickBooks account, making the business loan application process fast and easy. See how to generate and customize financial statements in QuickBooks. In order to legally operate, businesses must comply with certain requirements regarding the company’s transactions, labor practices and safety procedures. Learn about both internal and external requirements, such as the annual report, FLSA, franchise taxes, and more. When seeking financing, a company’s financial statements provide concrete evidence of its value. Read common mistakes made on financial statements – including mis-categorizing operating activities, investing activities and financing activities – and how to avoid them. How do I generate financial statements in QuickBooks? It’s easy to run financial statements in QuickBooks. Simply select Reports from the left menu and then from the top of the screen choose between All, Custom Reports, or Management Reports. All lists all reports based on business categories and also shows ‘favorited reports.’ Custom Reports shows reports with saved customization, and Management Reports displays business performance reports. Select the report name to open it. If you can’t find a specific report, try typing its name in the ‘Enter report name’ field to search for it.